My boss said I looked like Amelia Earhart in this outfit. That's not necessarily what I had in mind when I got dressed, but I'll take it. Happy Weekend! the "Amelia" look is in...so nice compliment...you look great...as always. You look so good here. Love it! Works so great with your cut! it does look like an amelia-inspired look. i love those pants! (and that necklace is a nice touch). those pants are perfection. i have no idea how you thrift such wonderfully tailored pants! first off, i can't believe you found those shoes at goodwill! and i have to say you pull off those pants better than anyone! this outfit looks great. Oooooooh, snap! I looooove this on you! You look fantastic! love those pants on you, they look amazing! This is one of my favorites; you look surprisingly lovely in that yellow color, and the necklace is divine! mmm.. amelia. i love it. 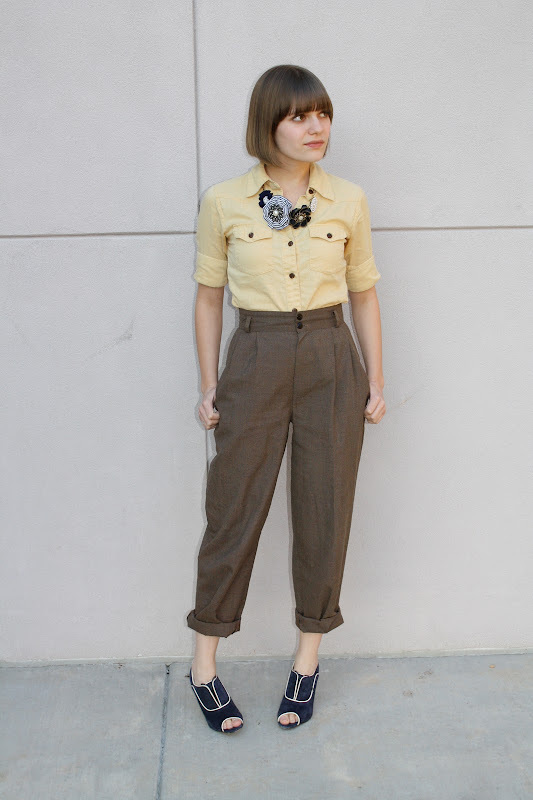 This outfit is such a cute mix of vintage and modern--it's awesome! Those trousers are PERFECTION! I love love love trousers and have been looking for a nice high-waisted pair in this exact color! Lucky that you have a beautifully tailored pair! oh man, you look so so cute. i love this outfit. i want to find some trousers like that at goodwill or something...don't want to spend too much on a trend that may look horrid on me. or maybe i should just scrounge around in the depths of my mom's closet for some old "slacks" ha! What a great compliment! You look fantastic! Those pants look fabulous on you!And the necklace is beautiful and ties in so well. Sweet outfit! I absolutely adore this!!! Those pants are amazing! And the necklace and shoes are kind of unexpected, but totally perfect! Looks really nice - structure! what a gorgeous pair of pants. absolutely love those shoes. This is such a sleek look and I love the necklace! I find myself coming back to your site more and more - it's wonderful! Keep up the great work! Lovely shoes and I'm drooling over that necklace! love the pants, they are so well tailored! just found your blog, you have such a stunning way of piecing outfits together, I cannot wait to see more! Would you like to trade links? Love the pants! Yes, your outfit looks like a combo of Earhart and safari. The jewelry and shoes bring it all together for a more modern look. love the pants! very chic! Those high-waisted trousers look fabulous on you! Haha, you totally do! Such a classy look. I absolutely love this outfit! It's perfect! Love the haircut btw! Happy Holidays!